Customers often ask us which knives we would recommend for their specific needs and which ones to choose to start their collection with. 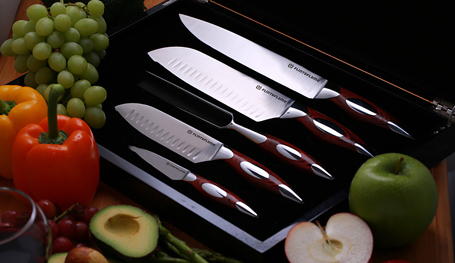 For that reason, we set out to create the perfect collection of knives that would handle any culinary challenge you’re likely to face. The result was the stunning Flint & Flame 5 Piece Gourmet Set – the perfect gift for seasoned professionals and budding home chefs alike. Slightly larger than most, it will tackle all types of joints, roasted poultry, fowl and even a hog roast. The larger blade means less sawing and less scoring on your topside joint as you slice it. It has a razor sharp point so it is ideal for boned or boneless joints. The 8-inch blade is the bigger brother of the two Santoku knives, and being that little bit bigger, it will do a little bit more of the work for you. A better tool suited for your large cabbages, swedes and squashes. A light and swift blade, you can chop and slice with the whole length of the blade due to its flatter design. With a razor sharp heel, it’s amazing for finely sliced ginger, spring onions and herbs. It features a wide blade making scooping or crushing a joy.